Daft Punk have never tried to live up to expectations. They frustrate their fans with painfully large gaps between albums and instead of recording, dip their toes into other media, like filmmaking. While they may or may not be working on a follow-up to 2005s Human After All, Thomas and Guy-Manuel have finally prepped their directorial debut for mass consumption. If youre expecting anything along the lines of 2003s Japanimation sensation overload Interstella 5555, or even a stimulator like their 2007 tour, set the stun gun to disappointment. Electroma is a bizarre art-house flick with no dialogue, only robots, and exhaustingly extended shots of everything from close-ups of the two main characters to slow panning landscapes in the desert. Starring Peter Hurteau and Michael Reich  thats right, Daft Punk are not actually Daft Punk in this movie, nor is their music used Electroma follows two robots that wish to become human after all. Surprisingly for a film with so much invested in painstaking minimalism and emotional detachment, there is remarkable poignancy in the characters defeat, which no matter how much this film rubs against you, youll feel. With all of the over-stylised motif, drawn out scenes and overwhelming pretentiousness, Electroma manages to be yet another Daft Punk masterpiece that lives up to their highly respected artistic code and meets the expectations every fan should have. What made you decide to make a film instead of another Daft Punk record? Thomas Bangalter: I think from the beginning when we started making music and just began our creative process weve always tried to express ourselves using different art forms. We did music videos after we finished our first album and did an animated film with our second album, and directed music videos with our third album. Its out of our impulse and curiosity to experiment in different media. It is important for you to be recognized for more than your music. Most people, I assume, just know you for making Daft Punk music. No, its not important for us to be recognized in any sense as individuals who what we want to create, goals are usually personal ones for us. Consequently we are recognized as musicians, but all of this has always been a very strong personal quest to creation and art in general. I did the camera work for the film myself, and I stopped working on music for a year and a half to work on the technical idea of what filmmaking is. There was a very nice article in American Cinematographer that said the work was very interesting, its always very flattering and makes us happy, but thats not what drives us to do it, or make music either. Especially in working with anonymity, the way weve done it, we cannot really say that all of this has been done in a way being recognized for anything. The first thing we would have done if we wanted to be recognized was to show our faces from the start. How much more difficult was making this film compared to making a record? just the two of us being in studio making music, we might not think its as stimulating an environment. Being able to work with so many talented and excited people, and to combine the skills of all these people to transcend into a particular vision is exciting and rewarding because its a collaborative process. And yet any kind of process like this can make it more difficult to achieve, but its also an art form that captures many different perceptions, which is totally different from our music. I can say its quite similar in that there are steps that can be fluid and fluent and easy, as well as difficult challenges, but its all of that that makes it exciting in a way. The human versus robot concept has been in your music for a few years now. Was Electroma something you were planning from the outset? No. One of the personal quests that we have in music and in everything is to try and capture spontaneity, the spontaneity of a glimpse of an idea of something we want to express. The robot thing is something we like because its really this metaphor for technology and a two-sided coin of something extremely seductive and exciting that you can have in popular culture. Theres the funky, cool side of what robots, and how technology can be so effective, exciting and efficient. On the flipside of the coin you have something that very scary and alienating and making people dependent on the real concept of what artificial intelligence or the replacement of human beings could be. It becomes something like Brazil, which is terrifying. 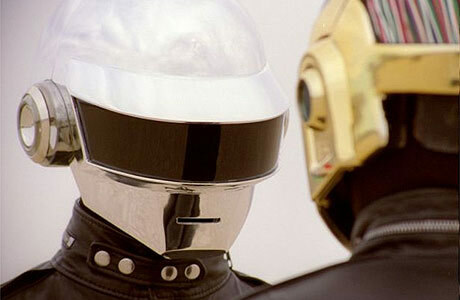 What made you hire actors to play the role of Daft Punk? As the storytellers and crafters, as well I was the camera operator, we had done a few videos for "Technologic, where we were both directing and starring, and the whole process was very tedious and the perspective of our approach with this film. We felt there was an opportunity for a much more personal process and work of art being behind the camera instead of being on screen. And the decision to not use your own music in the film? There are two reasons. The first was that having made music for 15 years the approach of making a decision to work on all the aspects wed never worked on, music was the last thing we wanted to do. The second reason was, in the story itself, we wanted to work on a film that we could not time; whether it was shot in the 70s, 80s or 90s or now, and in that sense the idea of no timing was something we did by using special film stock as well as classical music and older music, which might not be as contemporary as we would do ourselves. We thought that all of these peoples music would not only serve the story better, but once again, probably make it much more personal than if we did it with our own music. Much like a personal diary of these robots grabbing life that has no human beings in it. I was surprised by how much emotion there is to feel in the end. The interesting thing about emotions is that it isnt part of an intellectual process; emotions are the meeting point between the brain, and how it reacts from your gut. So its a very physical process as what defines humanity so far because theres not really such emotions in other animals. I think in that sense, we wanted to see how we could capture such emotion without human beings  without eyes, without faces. And in fact, the only actor in the film is the spectator himself. Its the viewer with his past experiences and memories that would in fact put these emotions through what hes lived. The experience is open to ones emotions. Its really the way it transpired, and the challenges of the film, like putting life in this very sterile, lifeless environment. Can we expect any new Daft Punk music soon? With Daft Punk were just currently experimenting art forms, whether their visual or musical. I think its a very exciting time for what the landscape of art and music because its changed so drastically. As artists I think its important to take that into consideration and decide what we want to create. So yeah, we are extremely excited about creation, and delivering new things. So, are you working on new music?